One of the most common questions I hear when working with new coaches is how to expand their client base and generate more income. This question typically comes from a coach who just received their certification, TrainingPeaks accreditation and/or started their business along with coaches who have been coaching for years. Whether you are trying to make coaching your full-time job, or have a strong and healthy side business and part-time job, the ability to create plans can have a large influence on your bottom line and outreach within the community you operate in. 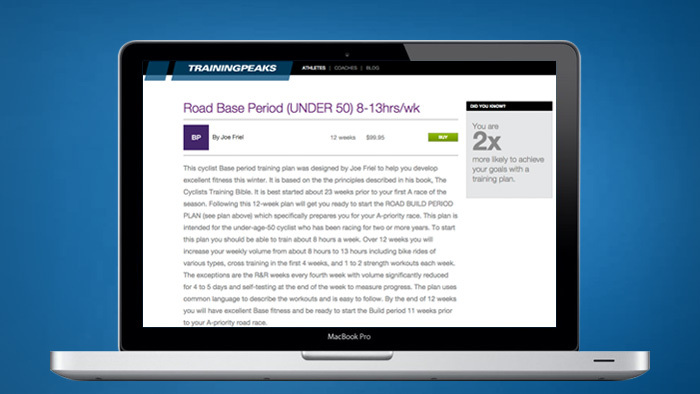 The TrainingPeaks Coach Edition offers the ability to create plans, or a series of workouts, you are able to apply directly to athlete’s accounts and/or sell. Plans can also be created based on events. Leveraging this feature within your local community can create a great following and many leads for future clients along with increase revenue helping your bottom line. I have seen this used with great success when partnered with a local event and that event’s promoter. There are a few ways this can be achieved based on your desired outcome. If your goal is to create new leads and expand your one on one coaching business, providing plans for an event for free can be a great way to get your business’ name out in the community. A great way to do this is to create a few plans, possibly based on the experience of the athlete. Then, create a unique URL within the ‘publish plan’ tab. You can provide the event promoter with this URL along with a coupon code that discounts the plan to zero dollars. Ask the promoter to include your logo and these details in a confirmation email for register participants. When an athlete looks at the plan they will see your company logo on the plan page along with your name. Once these athletes make the decision to hire a coach, you are the first person, and company, they think of when starting their search. If your goal is to increase your revenue, a similar approach can be taken. You can create training plans specific for local events and promote these on your company’s website, social media and possibly with the event promoter. You could also provide athletes with a discount coupon if they provide you with proof of event registration. Each training plan has the option to have a forced end date, or event date. This way and athlete who buys your plan will have it automatically applied to their TrainingPeaks account with the last workout as the event date. This is also a way to protect your plans so they are not reused by an athlete. Within the plan settings is your plan’s management tab, which includes a list of athletes who buy your plan. You can use this list to send a short email to introduce yourself and offer any help if they would need it. This extra step can be the difference in gaining that athlete as a one on one client later down the road or the athlete purchasing another plan from you and your company. Taking the time to be at the local events that you have partnered with, or targeted with your plans, gives that your business that extra credibility. Meeting some of the athletes face to face will have a lasting impact on their decision to hire you or purchase another plan. A small booth or table gives you the opportunity to hand out business cards and shake hands with the group of people within your community that are your potential clients and customers. There is a natural progression for most athletes as they gain experience. Starting as training whenever and however they are able, they move to using a pre-made plan to give more structure and consistency to their training. Finally, once an athlete feels comfortable and ready, they start their search for a coach. Creating a training plan connects you with the athletes that will soon be searching for their personal coach, giving you a head start on the hiring process. With some time and effort, training plans can help give your new business a jump start and an existing business some new and untapped revenue. Developing plans can also create some time savings within your coach account and existing clients. A bit of front end work can have a big payoff later down the road and also create a strong and well-recognized brand within your community. Tony Viton is the Coach Edition Sales Manager for TrainingPeaks, helping coaches understand how TrainingPeaks allows them to grow their business. He likes riding and racing bikes of all types but particularly enjoys any ride with dirt roads and multiple coffee stops.